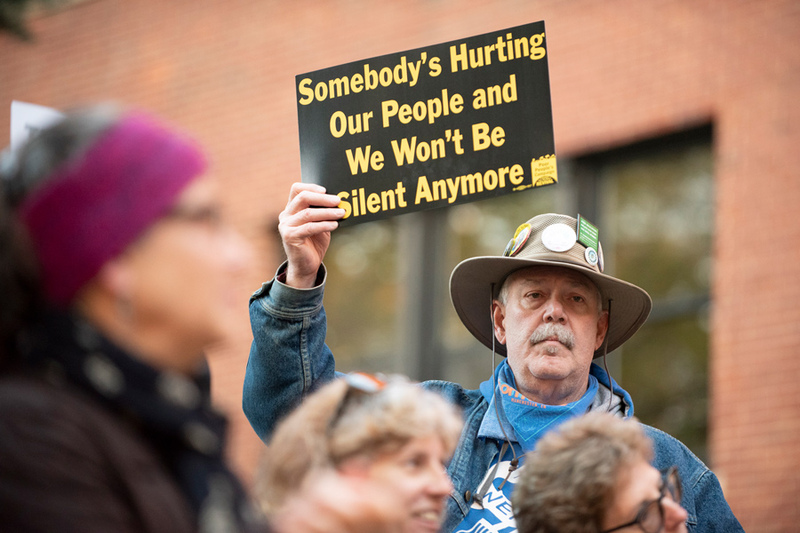 Attendees at the rally, which was co-organized by a number of churches and community organizations throughout Evanston, demanded a full accounting of the city’s budget process with a focus on its potential cuts to social services across the city. Interfaith clergy leaders held a press conference on the steps of the civic center, addressing various proposed cuts to the city budget. Since its release at the beginning of October, the 2019 budget proposal has garnered criticism from residents for proposed cuts and restructuring to the Department of Health and Human Services, the Youth and Young Adult Division and the possible closure of Evanston Fire Department Station 4 in the 2nd Ward. The group labeled itself as POP — Prioritize our People — and focused on the human impact of the proposed budget cuts. Rev. Michael Nabors, who represented the Second Baptist Church and the NAACP, said residents are aware of the deficit, but even more aware of the programs that would potentially be cut. Nabors said residents and aldermen should ask themselves what is more important to them — a balanced budget or “balanced families.” Nabors weighed the city’s need to fill its projected $7.4 million budget deficit with needs of residents, and urged local leaders to advocate for a long-term solution to the budget process, not a quick fix. Rabbi Andrea London, of Beth Emet the Free Synagogue, echoed Nabors’ sentiments. When Nabors began in the ministry, she said, he may have felt like he could change the world. Now, he feels like he and other residents can change Evanston, and London said she stands with him. Pastor Daniel Ruen, of Grace Lutheran Church, said he wonders what the city would do if the interfaith communities across Evanston would cut their services, in a similar manner to the proposed budget cuts. He said the effect on the city would be great, and that city officials should look to these communities and the way they provide services.